Vulcan Bomber flyover this Saturday! Do not be alarmed on Saturday afternoon as the legendary RAF Vulcan Bomber visits the skies above Hastings for a rare aeronautical display. ETA 3.40pm, eat @ the Stade should provide prime viewing and chewing position, leather jackets and billowing scarves strictly optional. Roger and out. 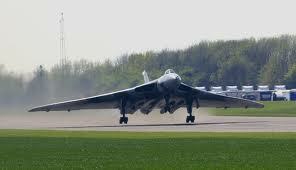 Please note that XH558 has not been in the RAF since 1992. She is owned and operated by the Vulcan to the Sky Trust, which relies entirely on public donations to meet the nearly £2m a year running costs. If you enjoyed her display and could spare a couple of quid (as it all helps), come along to http://www.vulcantothesky.org – it would be much appreciated. Thanks for the info, David – we stand corrected. And what a fantastic display it was – an eat @ donation is on its way.